As my wife Nenita was getting ready for the day I took a short walk back to the SNCF office in the Reims train station to get the real facts on what we could expect in view of the strike. The first thing I learned was that the tickets I had from Reims to Paris and also from Paris to London were now worthless as both trains were no longer operating. That was the bad news. The good news was that I was given new tickets and even upgraded for free for the last train out of Reims on our intended departure day. It would arrive in Paris about one hour before the last train out of Paris for London departed. It was a tight connect and involved walking from the Paris East train station to the Paris North train station about six blocks away. Making matters even worse the train from Paris to London was a Eurail train and so SNCF could not issue me any tickets for that ride. Nevertheless, we were assured a ride to Paris where we might have to spend another day or two or find some optional means of getting over to London — like swimming maybe or at least taking a boat of some kind. Well that would have to wait because it was another great day in Reims. This time we did something I almost never do, we took a ride on a tour bus. Well actually it started with a ride on a very cute trolley in front of the train station for just a few blocks until we reached the Cathedral of Reims. There were machines at the trolley station at which you needed to purchase your tickets but neither of us read or spoke French so we were clueless. Fortunately a young French man could see our confusion and came to our rescue. Merci! A few minutes later we arrived at the Cathedral. It was a centuries old magnificent sight. As it happened we circumnavigated the Cathedral because on one side was a Tourism office where we needed to purchase our tickets for the one hour twenty minute bus tour through Reims. However with tickets in hand we were sent to another location on the opposite side of the Cathedral where we boarded the bus. It was interesting and entertaining and there was plenty of mention of the severe damage wrought upon Reims during both World War I and World War II. We also cruised by a building occupied by General Dwight Eisenhower during the final days of World War II an event that happened long before most of the people living today even existed. On a much happier note we also saw several of the many Champagne cellars located throughout Reims including the one we had already visited, G.H. Mumm. But soon we returned to our departure point and Nenita and I began our own mini-tour on foot. Once again we circumnavigated the Fontaine Subé with its stunning Golden Angel perched above and keeping an eye on the City of Reims. Hunger soon brought us to one of the dozens of eateries that fill the City Center. This time it was Les 3 Brasseurs that offered outstanding food and fantastic micro-brewed beer made on their premises. I am not a regular beer drinker but I ordered La brune, the darkest of their several offerings. It was so utterly delicious I actually ordered a second glass. Yes, in Reims, France a place known worldwide for Champagne also has outstanding beer, at least at Les 3 Brasseurs. 73 Place Drouet Erlon, 51100, Reims, France. The rest of the day was a very casual walking tour as we awaited the arrival of our daughters Kimberly and Kari and our granddaughter Somaya from their side excursion to Venice, Italy. They too were subject to the stresses of the train strike as their flight from Venice took them to Paris from which their intent was to take a train to Reims but would that train actually be operating? Luck was with us and they did arrive right on time. I met them on the platform and walked them to our hotel, the Novotel Suites for they would be spending the night there and I would take the room on the other side of the train station in the Hotel Bristol. That decision was pure practical as our room at the Novotel was very spacious and had plenty of bed space for the ladies. The Hotel Bristol accommodations were far more modest but comfortable enough for one guy so it made perfect sense for this one night. The next morning we all gathered in the Novotel Hotel for a buffet breakfast and a little family chat about our options for the day. The only thing we knew for sure was that we would be departing Reims by train at 6:45 p.m. that night. What we didn’t know was if we would have enough time to board the 8:30 train to London and would we even be able to get tickets for that train? The tickets we had had become useless as the train we were to take would go nowhere that day. Eurail would exchange those tickets for the 8:30 p.m. train but only if there were seats available and that we wouldn’t know until we got to Paris. So we mentally accepted the very real possibility of at least one more night in Paris. Then we decided to let the day take care of itself and headed off for the carnival across from the train station. Immediately there was a haunted house that Kimberly, Kari and I simply could not refuse. One by one a small car we sat in entered the house for a series of some very scary stuff but all in good fun. That done we moved on and soon Somaya found a place where she could gather up little plastic ducks in a bucket and then exchange the bucket full of ducks for a stuffed animal. She was a very happy girl and we moved on. The weather was unusually pleasant that day, mostly sunny and right around 65 degrees making the overall experience just that much more pleasant. It was a warm and wonderful family bonding experience and everyone was happy. Kimmy took a wild ride and we all cheered her on. Then we came upon a device that tested our strength in both our arms and legs. None of us had impressive arm strength but Kari who had been a dancer for many years could still kick impressively. We all pledged a wee more gym time when we got home. By now we were all getting hungry again so we wandered off towards a sushi restaurant which wasn’t yet open when we got to it. But nearby was a very charming little bakery with a warm friendly lady, great baked goods and an amazingly beautiful ambiance. Satisfied our totally unguided walking tour continued on. Once again we passed Fontaine Subé and then a short while later we entered a wine store I had seen a few times and remembered for its beautiful and wild window display of anything and everything wine. 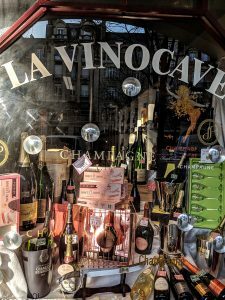 The name of the store proclaimed boldly on its window is “La Vinocave” and inside we were greeted by two men who were the epitome of pleasant. Instantly my wife Nenita, who never drinks wine, engaged them in a conversation about Champagne and she actually bought a bottle of Hubert Paulet Champagne Cuvee Tradition Premier Cru Extra Brut N.V. for 21 Euros or about $26.00 which as it turned out was less than half of the retail price in America and it ranks in the top 2% of wines worldwide. I was concurrently stunned and thrilled. My totally wine innocent lady just scored a terrific deal in something she knew nothing about and yet it made her happy. So I asked her — Why? Her response was perfect. “It was fun!” Like I said it was the perfect family day. We slowly worked our way back to the Novotel Suites Hotel there to gather up our bags and prepare to bid farewell to magnificent Reims, France. Soon we each grabbed a bag and began our trek to the nearby train station to board the last train of the day to depart Reims for Paris. But the burning question remained, would we be departing Paris tonight? Our SNCF train pulled into the Paris East train station right on time and as fast as the abundant pedestrian traffic would allow we worked our way out of the Paris East station and in the direction of the Paris North station. I soon spotted the office for Eurail one level above the main entrance. As I made my way to the office the ladies headed for the line to board the 8:30 p.m. train to London. Standing in line in the Eurail office seemed like an eternity but sooner than it felt like I was invited forward to speak with a Eurail clerk. I presented my paper work and she slowly shook her head. It wasn’t looking good but she kept on clicking away on her computer. Finally with a look of exhausted joy she handed me five premium class tickets for a very recently created 9:00 p.m. train from Paris to London. We didn’t make the supposedly last train of the day at 8:30 p.m. as it was overbooked and closed out but we did get great tickets and only 30 minutes later than the train we were supposed to be on. It was a typical Eurail ride in total comfort and complete with a nice meal and excellent wine. Upon our arrival at the St. Pancras International Train Station in London we could have taken the underground train to Brent Cross but while the underground train system in London is easy to use and very efficient the time was getting late and we had a lot of luggage so we took a van taxi instead arriving at our home for the night the Brent Cross Holiday Inn right around 11 p.m. There I had one more adventure to deal with before turning in. With all of the many details we needed to work through to make this trip not only possible but fun I actually made one little error. We needed two nights at the Brent Cross Holiday Inn and I knew that yet somehow I had booked only one night. The clerk was neither dismissive nor particularly helpful so I decided that whatever needed to be done could be best done the next morning. Clearly the elephant in this travel day had been the severe uncertainty of even getting to London and we had gotten that done, so less important matters could and would wait. Good night.